Today, 14 October is the 119th anniversary of Arsenal’s all time FA Cup record victory. It came right at the start of the Woolwich Arsenal era, and is recorded in detail in the book, Woolwich Arsenal the club that changed football. Below is an extract from the book that relates to this occasion. In 1893‑94 the FA Cup ran from 14th October 1893 (the date of the first qualifying round) until the final on 31st March 1894, via four qualifying rounds, the three “proper” rounds, plus the semi-finals and a final played at Goodison Park, in front of 37,000 people. By this time many of the teams playing in the first round proper in January were the teams we still know today – Liverpool, Grimsby Town, Preston North End, Nottingham Forest etc, although there were also some that will now be less familiar (Heanor Town for example) and some who are no longer with us (e.g. South Shore who amalgamated with Blackpool in 1899). The FA Cup was the cornerstone of public interest in football. Cup matches got much higher crowds than many League games, both for Woolwich Arsenal and for other clubs, and were reported more fulsomely in the press. What’s more, because the preliminary rounds were played on a regional basis, the games give us a chance to get a view of how football in Kent and South East London was developing at the time. Ashford United F.C. from Kent was formed in 1880 and were founder members of the Kent League playing at Godinton Road, Ashford. They closed in 1906 and the 21st century club of this name is a youth club. 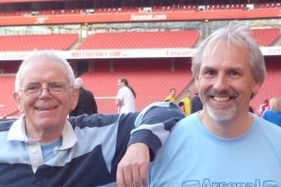 A year before Arsenal had beaten City Ramblers with three players getting hat tricks, but this time it was not to be. Elliott and Henderson each got their three (as they also had done against the Ramblers) but the other goals were shared between Heath (2), Booth (2) Crawford and Powell. The match is also noticeable as the game in which Woolwich Arsenal made an offer to the opposition which if made today would risk the club being expelled from the Cup and quite possibly the Premier League as well. The fact that the offer is made openly and reported in the press reveals the different standards that applied in the FA Cup in these early years. The teams being drawn together for the English Cup Competition, the tie came off on Saturday at the Manor Field, Plumstead. It was generally conceded that the Arsenal had got a soft thing on, but even their most ardent supporters were quite unprepared for the 12 goals to nil victory which they obtained. Last year the visitors gave a very good account of themselves, one of their best performances being the defeat of Chatham in the Kent Cup Competition. So sure were the Arsenal executive of their team going through to the preliminary round that they offered the Ashford United Club £20 to scratch to them, and promised to send their second team down to give them a game on their own ground. Had this offer been accepted both clubs would have benefited considerably for on Saturday instead of the usual 6,000 or 7,000 only some 2,500 paid at the gate. To describe the game would be a waste of time. From start to finish there was only one team in it, and that the “Reds”. Two minutes from the start goals were scored by Elliott and Crawford, whilst only seven minutes had elapsed ere a third was obtained by Booth. Further goals were scored by Henderson (2), Powell, Elliott, and Heath, and on crossing over the Arsenal led by 8 goals to nil. In the second half they somewhat relaxed their efforts, whilst the visitors, having a strong wind behind them, were seen to a better advantage. Additional goals were, however, scored for the “Reds” by Booth, Elliott, Heath and Henderson, in order named, and the visitors failing to notch a single point a very one-sided game ended in a won for the Arsenal by 12 goals to nil. Woolwich Arsenal.- Williams, goal; Powell and Storrs, backs; Davies, Buist, and Devine, half-backs. Crawford and Henderson (right wing), Heath (centre), Elliott and Booth (left wing), forwards. Ashford United.- Young, goal; Niven and Beaney, backs; Harrison, Mills and Davies, half-backs; Campbell and Wenbourne (right wing), Keene (centre), Holley and Hodstock (left wing), forwards. Linesmen: Messers F. Beardsley (Arsenal) and A Goldsmith (Ashford United). Referee: Mr T Saywell Chatham). This was indeed Arsenal’s first team – not the reserves they had offered to send if Ashford scratched from the competition. And we may notice that Woolwich Arsenal director Fred Beardsley was a linesman. The Chapman formation: did he really create something new? Did Chapman really introduce a new playing formation in 1925?